Developing Young Singers through Vocal Exploration, Warm-ups, Rounds, Songs, and Singing Games. Composed by Madeline Bridges. Book and DVD. Published by Chorister's Guild (CG.CGBK66). This unique resource offers children's choir leaders and classroom music teachers an ideal guide for leading young singers to participate in joyful, purposeful singing experiences. 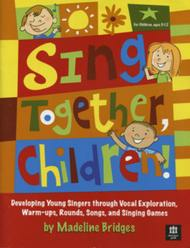 Organized into five chapters, the resource draws music primarily from a folk tradition combining over 75 singing activities into the following sequential teaching process: 1) Exploring the voice; 2) Developing young singers; 3) Singing and moving; 4) Building choral skills; and 5) Singing in harmony. The singing activities range from vocal-exploration activities and action songs designed for young children to more advanced folk songs and dances for older children, plus warm-ups, vocalises, choral technique songs, rounds, and songs that teach part-singing. Each chapter also features an efficient, pedagogically sound teaching plan that teachers can use along with the demonstration DVD included in the resource. Perfect for use throughout the year with children ages 5-12!